The paper discusses the aspect of branding in social media, and how it differs to branding in traditional media. The benefits of higher awareness, greater authenticity and continuous communication are discussed. Moreover the significant factors interactivity and co-creation are highlighted, resulting in power shifts to empowerment of the consumer. Applying these aspects to the company Glossybox, it could be seen that all of them play an important role and are being executed by the firm. A framework of the Consumer Decision Journey in social media was adopted in regard to Glossybox. It was found, that when the above-mentioned aspects apply and are being executed correctly by the company, the risk of the empowerment of users is reduced and the benefits of successful branding are visible. Branding is becoming an increasingly important aspect for companies. Having a unique brand gives a company the opportunity to enhance the image and develop a personality (Aaker, 2004). The goals of branding are to establish and clarify the company’s core values and corporate identity, presenting the uniqueness of the products or services offered and differentiating these from the competitors (Aaker & Jacobson, 2001, Nassar, 2012). Moreover, a successful brand assists in sending a clear message and even establishes a connection between the consumer and the business. Thereby not just the credibility of the company is enhanced, but the customer is also becoming more loyal to the brand and thus the company (Lake, 2012). According to Nassar (2012) this consequently leads to a higher productivity and more profitability. Through the sharp increase of the Internet and the creation of online or social media (Jones, 2009; Nassar, 2012), consumers are spending increasingly more time online. In order to continuously reach these customers, companies have been entering this new media and integrated it in their marketing activities (Falcow, 2009). However, businesses were not supposed to be in social media when it was created. According to Fournier and Avery (2011), it was only meant for individuals sharing and connecting with others, on a private basis. Nevertheless, it offers new and tempting opportunities, which is one of the reasons many companies entered the new media in order to represent their brand and to stay in touch with their customers (Nassar, 2012). Due to the status of the unwanted presence, as Fournier and Avery (2011) call it, companies have to be especially aware of the different practices of marketing and branding online, in order to leave this unwantedness behind. This paper will deal with the above-described issue. As this new media is becoming more important, but different rules apply and roles change, the aim of this study is to investigate branding in social media. The company Glossybox will be taken as a mini case study and theory will be applied and tested. Therefore its online presence was continuously observed. The paper will continue with a literature review regarding the aspects social media, online branding and the new role of the consumers. The discussion will follow with an application of the theory to the company and will be ended with a conclusion and recommendations for further research. Social Media is becoming increasingly important. The numbers of visitors to social media sites is growing significantly every month. Armelini and Villanueva (2011) exemplified this with numbers, showing that 24% more people used social media in April 2010 compared to the same month the year before. Furthermore they state that the time spent at these sites went up by 66% per user. According to Armelini and Villanueva (2011) more than 80% of Internet users from Europe have an account in at least one social network. Half of the time that people used to spend on traditional media has been shifted to social media (Armelini & Villanueva, 2011). Especially Facebook and Twitter play a significant role; in 2011 640 million Facebook users were registered as well as 200 million twitter users (see appendix 1 for more information). When taking a closer look at the numbers, it becomes quite clear why so many businesses strive for social media presence. It has a few advantages over traditional media. Aggarwal (2009) argues, that through social media, companies are able to build a relationship with their customers like they never could before. Edelman (2010) agrees with that, he states that new ongoing relationships are developed through social media. Another advantage is the possibility to receive quick feedback on a company’s marketing activities and messages, directly from the persons who are most important, the customers (Aggarwal, 2009). Customers can contact the company more easily about enquiries, thus efficient customer service can be the result, if the company responds (Nassar, 2012). He argues further, that companies should not make the mistake and stick to one social media only, but spread on many different sites. The reason for this is, that customers increasingly use multiple linked social media sites. This also gives firms the opportunity to spread their information. Moreover, Yan (2011) explains that social media offers a platform for consumers to engage and access brands. If companies use it accurately, social media can serve as an extremely valuable platform for spreading their voice and message. There are a number of publications on branding in social media, for many different sectors and with their own specialties. In general, it can be said, that there are three types of new media that can be used for branding, some that managers can and others they cannot control (Winer, 2009). These are intrusive, non-intrusive and user-generated. Intrusive is Internet advertising such as banners or pop-ups on websites, as well as m-commerce, which concerns mobile phone marketing. Non-intrusive media includes Internet advertising that has to be activated, like sponsored search, as well as social networking sites, such as Facebook, YouTube etc. Furthermore podcasts and viral marketing are a part of this kind of media. The third kind is user-generated, which consists of blogs, video sites and ratings or recommendations that users can make. Branding in social media is different to traditional means. In order to show the difference that social media makes in the consumer decision journey, Edelman (2010) developed two figures that are useful for brands (see figures 1 & 2). The first one displays the traditional way of decision-making. Consumers would start with many brands and eliminate one after another but in the end would only have a utilitarian relationship with the brand. On the other hand, the newly developed framework shows that consumers add and eliminate brands during their evaluation. Furthermore they start bonding with a brand and develop a relationship. 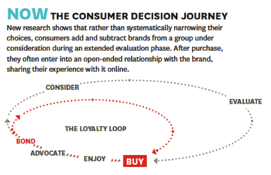 This leads to a loyalty loop where they share their experience online. Especially the evaluate and advocate stages are important in social media, so businesses should focus on these in particular (Edelman, 2010). Social media is all about interactivity; consumers interact not only with the company, but also with the media and most importantly with each other (Winer, 2009). Singh and Sonnenburg (2012) agree to this, and add, that this leads to the co-creation of brands, as companies collaborate with consumers. According to them, social media changed the interaction between consumers and brands. They can review it, make advertisements and write about the brand in the social networks. All this leads to the co-creation of the brand. They compare it to improvisation theatre where the audience has to help forming the play. As the role of the narrator and listener changes between brand and company, a co-creation is established, which leads to an interactive relationship between the participants (Singh & Sonnenburg, 2012). This concludes in the empowerment of consumers who have the possibility to influence the brand and co-create it. Especially then companies have less power over their brand than in the traditional media. This can be dangerous, as users have power to change the brand into a different direction; however, it makes the brand more authentic, too (Cova & Pace, 2006; Christodoulides, 2009; Fournier & Avery, 2011; Hanna et al., 2011). Furthermore the users can co-develop the brand strategy and give feedback, which makes the brand more relevant and appealing (Yan, 2011). In order to get a better understanding of the above-discussed literature, it is applied to the company Glossybox. Glossybox is an internationally working company, founded in February 2011 in Berlin, Germany. Currently it is available in 16 countries all over the world (Mazzulo, 2012). The concept of the company is simple but successful. It sends boxes with 5 high-end, trend and niche beauty products monthly to its subscribers. The selection is always a surprise, but tailored to the customers’ needs. Customers have then the possibility to buy the full-size products on the company’s website. The products in the boxes are sponsored samples from cosmetics companies, which receive customer data regarding preferences and evaluation feedback from the users (Marketing week, 2012). The target group of Glossybox are early adopters (Mazzulo, 2012). Glossybox applies a mix of marketing activities. They do offline activities such as promotional stands in cities to inform and attract people as well as PR activities like features in magazines and other traditional media. However, social media is the biggest part of its marketing activities. Especially the main social networks and blogs are their most significant tools. Figure 3 summarizes the social media channels of Glossybox. Aggarwal (2009) discussed the advantage of receiving feedback from the consumers. This applies to Glossybox too. An example is feedback on pictures on Instagram, where fans liked its current marketing activity of being physically present in cities. Furthermore Nassar (2012) wrote about the possibility to contact the company and establishing customer service in Social Media. With Glossybox, this is especially remarkable on twitter. Here many customers contact the company through a tweet and they reply to all of them within a short period of time. Also the aspect of being present in multiple channels is discussed, as shown in figure 3, Glossybox is present in all of the most important social media networks. Winer (2009) developed the theory of 3 different types of new media, Glossybox mainly uses non-intrusive as well as user-generated media. Regarding the non-intrusive, figure 3 shows the main aspect, the social media networks where Glossybox operates. Also the user-generated media plays a significant role. Glossybox operates one blog with own content and additionally works with many bloggers in various countries in order to increase its online presence. Furthermore it is present on video sites through their own videos and those from users. Winer (2009) also discussed interactivity; the Glossybox pages all show that there is a high degree of interaction. On sites like YouTube or Pinterest consumers interact and talk to the company and each other. This also leads to the co-creation, as the consumers produce material about Glossybox, which influences the brand image. When applying the framework from Edelman (2010), one can see that Glossybox operates in several of the stages. Regarding the bonding, one can see from the various likes, comments and shares of each entry that the customers seem to have bonded very well with Glossybox. Also the sharing aspect can be seen through Instagram, Pinterest or YouTube, where the users publish their boxes and their opinion about them. Looking at the evaluate stage, Glossybox uses polls on Facebook, to find out which item was best, to help the users, to receive feedback and to make them feel like they can participate and co-create. Moreover the advocate stage happens frequently through the sites, consumers help each other, give reviews and recommendations through sharing their experience. According to these above-mentioned observations, the framework of Edelman (2010) has been enhanced with the activities of Glossybox. It can therefore serve as a case study for other companies operating in social networks. The paper has shown, that when it comes to branding in social media, different rules apply than for traditional branding. It offers certain benefits, such as a higher awareness and continuous communication as well as exchange. Companies benefit from the feedback they get from their customers. Furthermore interactivity and co-creation are a significant factor in social media branding, which also leads to the fact that power shifts in social media appear. Here, users have a greater power to create the brand than in traditional media. The case of Glossybox has shown the importance of correct branding in social media. When the above-mentioned aspects apply and are being executed correctly by the company, the risk of the empowerment of users is reduced and the benefits of successful branding are visible. Taking the adopted framework of Glossybox, further research can be done regarding companies from other industries in order to test, whether it also applies there. Hanna, R., Rohm, A., Crittenden, V.L. (2011). We’re all connected: The power of the social media ecosystem, Business Horizons, vol. 54, pp. 265-273.